“Climate 2009 / Klima 2009″ will encourage more networking and information exchange among participants and hopefully catalyse new cooperation initiatives and possibly new joint projects. Besides the refereed scientific papers, we will offer you a chance to discuss the problems, barriers, challenges and chances and potentials related to climate and sustainability research. Special discussion fora and chat rooms will cater for direct interaction with the participant scientists. 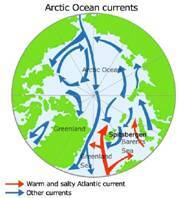 The Arctic is an ocean. 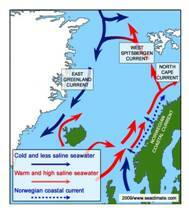 By the Fram Strait at about 80° North, between Greenland and Spitsbergen, it is connected with the Atlantic, which serves as a major gate for the supply of warm and saline water to the Arctic Ocean, which is coming with the West Spitsbergen Current. 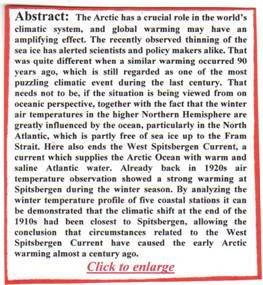 The subject of the paper is whether the warming in the early 20th Century has been caused here. 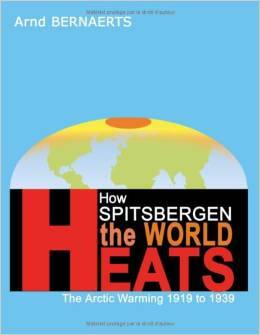 the circumstances around the year 1919 when the warming started. The method of investigation will be explained in the second section of the paper, based on a general picture that will be presented first of all. The third section is about the “circumstances” which will analyze temperature records in the Northern North Atlantic realm that may provide clues concerning the location, the timing, and the likely source of the warming event, and thereon discuss the information. Nowadays the polar region is often mentioned, because the Arctic is currently experiencing a rapid warming with a dramatic loss of Arctic sea ice, which could be due to a combination of a global warming signal and fortuitous phasing of intrinsic climate patterns (Overland, 2008:289). The rapid warming is likely to be anthropogenic (IPCC, 2007b:83, 86). According to Serreze et al. : “Rises in surface air temperature (SAT) in response to increasing concentrations of greenhouse gases are expected to be amplified in northern high latitudes, with warming most pronounced over the Arctic Ocean owing to the loss of sea ice“, (Serreze, 2004). 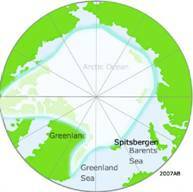 A recent U.S. government report concluded that the “temperature change in the Arctic is happening at a greater rate than at other places in the Northern Hemisphere and that the ice cover in the Arctic began to diminish in the late 19th century and this shrinkage has accelerated during the last several decades (US Geological Survey, 2009:486, 6). But the recent warming is the second during the last 100 years. 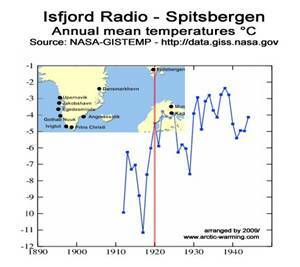 The last IPCC report refers to a warm period from 1925 to 1945 (IPCC, 2007a:7), while an earlier report mentions a warming around the years 1920-1940 (IPCC, 1990:215). More to the point is the finding by Polyakov et al. that concludes: the warming during the 1920s –1930s was very fast in spring, autumn and winter, but much weaker and slower in the summer, while the period between 1918 and 1922 displays exceptional rapid winter warming (Polyakov, 2003:2072). Nevertheless the authors assume: that the complicated nature of the Arctic temperature and pressure variations is making the understanding of possible causes of the variability, and evaluation of the anthropogenic warming effect most difficult” (Polyakov, 2003:2076).